Join the discussion on our forums! Come discuss Toxfin over in our dedicated Toxfin discussion topic. Bluegill Warrior and this creates a 3-mana removal. And you can find a Lackey that gives Rush to do the same trick. It's like Hunter's Mark, except that it's neutral, costs only one and leaves a 1/2 murloc behind - but it requires a murloc themed deck. This card is insanely overpowered. 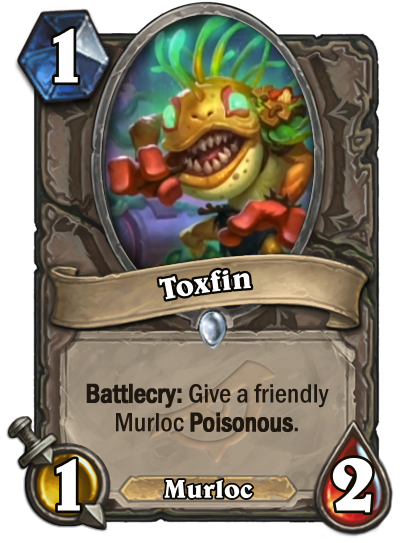 Even at 2 mana 1/1 this card would be played in every murloc deck!!! This is one of the strongest cards in the expansion! For Murloc decks this is a better-deal Plague Scientist that doesn't require Combo. Auto-include in most Murloc decks.